So I've talked in previous posts about feeling creative and wanting to find ways of expressing that. This, I think will be my first venture into it. I call it (though I'm sure it's already named and others have done this), BookSmack. I thoroughly enjoyed the book. It left an impact on me in some profound way. I foresee needing this book in some research capacity. I will use it for teaching. It's a text I've used or plan to use in the future. But given that I read 200+ books a year and many of them I am purposely choosing for reasons #2 or #3, that means I have accumulated a lot of books (and some awesome bookshelves). Besides regularly revisiting these books, I thought about how else can I use them. How can I share their ideas, thoughts, challenges, and provocations? Standing at my bookshelf, I angled my neck and proceeded to read the spines. In moving over two in a row, I was amused by the juxtaposition of titles and so came forth, Booksmack. Booksmack is the intentional alignment of book titles to create a statement. When I first posted a few on Facebook, someone called it "Book Poetry," which it certainly can be. I'm not setting up rules for others here; after all, I probably didn't invent this of my own accord. But in my adventures with Booksmack, I plan to put these books together to render some purposeful meaning. I don't just want to say, "Hey, that's funny." But I want to link together the books themselves. Part book review, part-footpath of where I've been intellectually, and part exploration of interconnections that I can make sense of, I think this can be a fun and enjoyable way to "smack" books together. 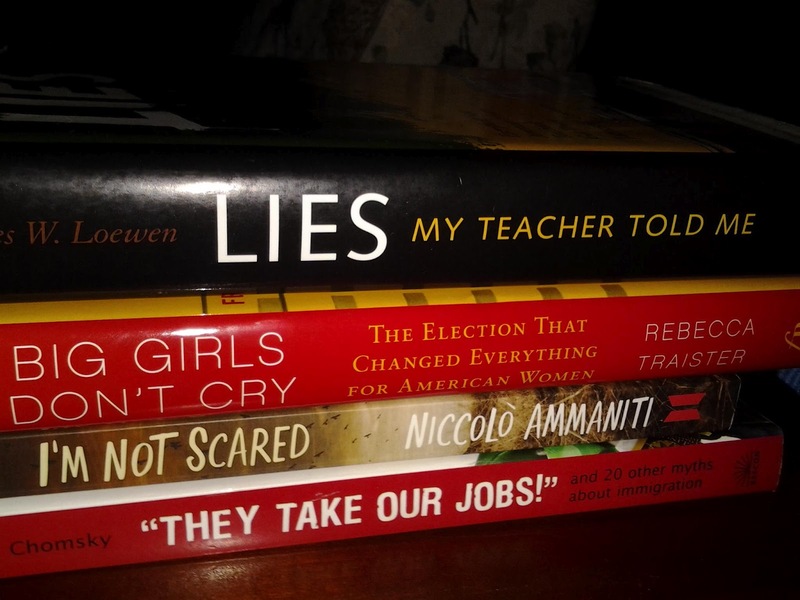 Lies My Teacher Told Me (by James Loewen): Big Girls Don't Cry (by Rebecca Traister), I'm Not Scared (by Niccolo Ammaniti), and "They Take Our Jobs" (By Avi Chomsky). This collection works well together and was one of my initial concoctions that I found to be inspirational. Loewen's approach to considering history and the whitewashing that it has taken over the years is a great opening to the ensuing dialogue of the next three books. Loewen's argument is based upon examining 12 history textbooks and analyzing their lack of historical inquiry over information. I first read this book in the late 1990s when I was a history student at college and have come back to it time and again. It speaks to a lot of issues with history being taught as facts and dates as opposed to discussion and argumentation about the importance/relevance/significance of people, events, and places. 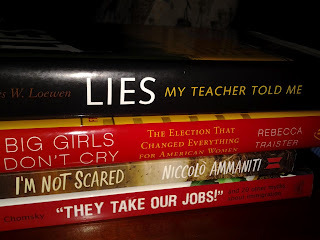 Loewen's opening gambit of lies perpetrated by teachers (or rather school systems, ultimately) plays upon the idea of the other books in which there is a betrayal of sorts of narrative over truth. Big Girls Don't Cry is a fascinating exploration of the role of gender in the 2008 presidential campaign and one that fundamentally changed my thoughts about Sarah Palin (and to a lesser degree, Hilary Clinton). Like Lies My Teacher Told Me, Traister's book helped me peel back the cultural narrative around gender in politics in ways that is otherwise lacking in our culture. By contrast, I'm Not Scared is a fictional book about a young boy and the conspiracy of adults trying to deal with poverty through less acceptable means (kidnapping a famous person's son for ransom). The narrative focuses around a village boy and his friendship with the kidnapped boy while the world around them conspires to do harm. There is a film, which I happened to see first and absolutely love it. Finally, "They Take Our Jobs" is a fantastic book by my mentor in college, Dr. Avi Chomsky. Like the other Loewen and Traister, she deconstructs the narrative we have around immigration. Point by point, she uses both reasoning and research to destroy the various myths associated with immigration, placing it in its socio-economical historical context and tracing out the ways in which and why we have prejudiced opinions despite not actually knowing the facts. Together, the four books speaks to the ways in which society miscommunicates to its citizenry and though often they believe they are doing it for our benefit (as both Lies My Teacher Told Me and I'm Not Scared tend to posit), they still account for gross cultural hostilities and prejudice (as both Big Girls Don't Cry and "They Take Our Jobs" shows). So there it is. Four books, one statement, neatly tied together.